Totem pole art at the Harding Street interchange. A total of 58 poles were designed by Jason Bord and installed. The 2010 Lilly Global Day of Service focused on the six-mile I-70 corridor running from the airport through downtown Indianapolis. Keep Indianapolis Beautiful, Inc. (KIBI) a local nonprofit with a 30-year track record of successful beautification partnerships in Indianapolis, envisioned something much grander than the usual highway ramps. Bringing together the city of Indianapolis, the Indiana Department of Transportation, community leaders, neighborhood groups, and the private sector, KIBI coordinated a master planning process for the corridor with the landscape architecture firm Browning Day Mullins Deerdorf. 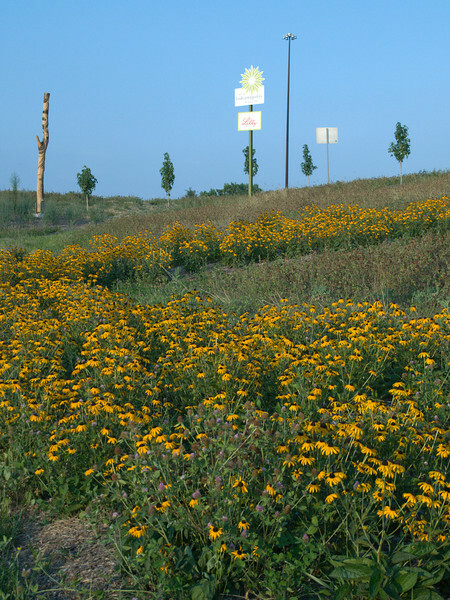 The project culminated in the 2010 Eli Lilly Day of Service, where over 8,000 Lilly employees added low maintenance vegetation, planted trees, and positioned totem poles and lotus leaf sculptures, transforming the I-70 corridor. The $1 million TE grant supporting the project was matched by an additional $1 million from Eli Lilly in addition to the volunteer labor, a major private investment on behalf of public infrastructure. Learn more about this extraordinary project at http://www.agreenerwelcome.org/.